Common name of fungal leaf spot. 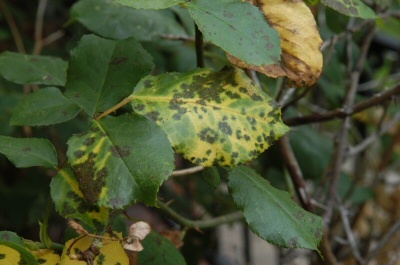 Black spot attacks the foliage of plants such as roses. There is usually a yellow halo around the dark spot. Entire leaves then turn yellow and ultimately die. Best controls include selection of resistant plants and Garrett Juice plus garlic tea and diluted milk. Keep bare soil mulched. Apply cornmeal to the soil or cornmeal juice to the foliage. PureGro Disease Stop and BioSafe are effective commercial products.